Hello. Thanks for visiting the online home of the Caldera Theatre Company. Everything is quite new here, so more will be posted as we grow and evolve. 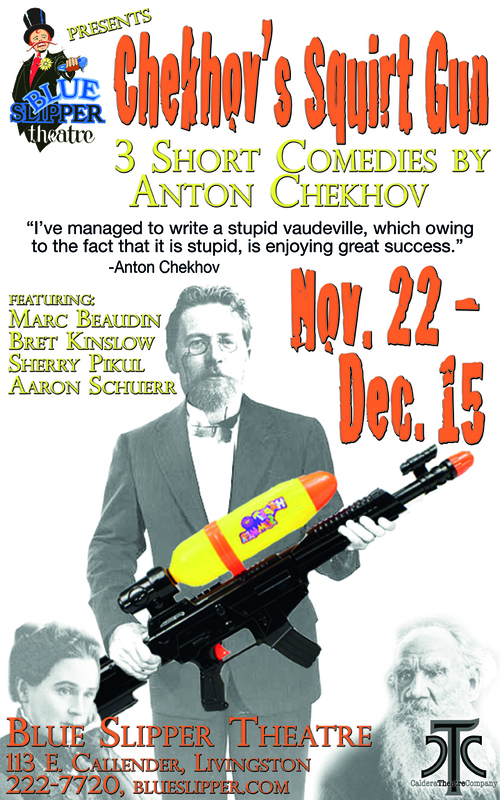 As a group, we’re performing in the Blue Slipper Theatre production of Chekhov’s Squirt Gun, which opens November 22. We hope to see you there. We’re very excited to begin bringing you theatre from the edge and beyond. Theatre with the subtle, underground passion, heat and volatility of our near neighbor, the Yellowstone Caldera. The following is an attempt to elucidate a starting point, or points, for further study, development and discovery in the practice of theatre. It was conceived and mostly written on the back porch of a cabin overlooking Seeley Lake in western Montana, with the accompaniment of calling loons and strong coffee. It is a work in progress. 1. Theatre is the Art of Sharing the Experience of Living Truthfully, in The Moment, within Imaginary Circumstances. To state that theatre is art may seem self-evident; yet it is one of the most commonly forgotten truths we encounter. Actors forget it, audiences forget or never knew it, boards of directors and producers have so perfectly forgotten it they cower in fear and loathing at the mention of it. This is primarily due to the fact that there is something out there very similar to theatre: It uses many of the same techniques and the same language. At times, it is very artistic and once in a while, becomes theatre; yet, it is profoundly different from theatre. It is different in its goal and its direction. Its goal is to entertain, “to show-off,” to say “Look at me!” Its direction is from the surface, outward to the audience as mere spectator. Conversely, the goal of theatre, while still highly entertaining (when it chooses/needs to be), is to explore; to challenge and transform. Its direction is inward. Into the psyche, into the emotional truth of being human, into the soul and to the creative, timeless and nameless universe that lies both beyond and within. Further, the audience is more than spectator: the audience is a participant, a fellow-traveler in this exploration. This other thing that is not theatre, though it is called that, is what fills nearly every stage in America from the grotesque spectacle of Broadway to the most insular, small town, community playhouse. This not-theatre (call it “staged entertainment,” “spectacle,” “play,” what-have-you) can be fun, can be moving and artistic; but it is not art in the same way that pop music may be brilliantly performed, fun to dance to and carry a poignant message in its lyric, but it is not art. Its direction is outward rather than inward. The confusion of this not-theatre with theatre results in great frustration. Artists involved in it are constantly accused of not catering to the tastes of the audience; of taking too much time with so-called unimportant details like character development, script analysis and “philosophy;” of not being “marketable” enough or “accessible” enough or “practical” enough. In other areas of creative work, we might expect these criticisms to be leveled toward the builder of an office building but never a sculptor, a house-painter but never a painter whose canvasses are meant for gallery walls, rather than drop cloths on the floor. It’s the lack of a definitive border between theatre and not-theatre that causes the problem, rather than a shortcoming of the artist or of the non-artist. Not-theatre can be great fun, and sometimes it can pay the bills, and sometimes audiences love it; however, the same is true of theatre. So what’s the advantage of not-theatre? Why does it seem so much more popular? The answer is the same as for any such question in America: it’s easier. Easier to do and easier to receive. It places very little demand upon anyone. It is enjoyment without the challenge and risk of change. This is a happy circumstance for anyone asleep and not wanting to be awakened, but it is absolutely intolerable for those who are awake or ready to become so. Art is, along with wilderness and solitude, among the most effective means for becoming awake. Theatre must reclaim its duty to serve this end, and not settle for less. The not-theatre serves that other function superlatively. It’s been said that all art is revolutionary. This is true. All art carries the potential for transformation, to change who we are and what the world is. This is, and should be, frightening. This is, and should be, dangerous. This is, and should be, vital to human evolution. Art without an audience is therapy. Art in which an audience merely spectates is exhibitionism. What must happen for something to become great art or true art is a sharing of the experience, not between artist and audience, but between Art and audience. Sometimes years or centuries separate the creation of the art and the sharing, but this is of little consequence (save for the artist who starves and dies unknown). In the fire of creation and inspiration, time is of no matter as long as the sharing eventually takes place. This can happen, and often does, in the non-performing arts: the genius of a painter or writer can go unnoticed for generations. However, in these cases there is often present from the beginning an astute audience of one – the artist. With many arts, the artist can also be the audience – she can read and be moved by her written poem, he can gaze into and through his painting. But with the performing arts a special situation arises in that the audience must be present at the moment of creation since it only exists momentarily. And because the actor is the medium in which the art is created, he or she cannot be the audience, for at the moment of creation the actor is fully consumed by and drawn into the act of creation. The paint cannot see the painting, the sounds cannot hear the music. The medium may or may not be the message, but it is certainly not the receiver of the message. Now imagine a painting where the paint disappears the moment it is applied. For that art to exist, the audience must be fully present as the artist dances with his brush. Not just watching, but fully engaged. The painting gains immortality in the memories, imaginations and inspirations of this audience. And, as in all arts, this audience must truly share in the experience of creation, rather than remain a spectator. A spectator passively “sees” a painting, but doesn’t really “look” at it. A spectator passively “hears” a piece of music, but doesn’t really “listen” to it. Seeing and hearing are automatic functions of the sense organs: if your eyes are open and functioning, you’ll see whatever is before them, but to really look at or listen to something is a conscious, intentional action of the intellect and will. Living truthfully in theatre does not mean to limit oneself to realism. Theatre can be as real or as fantastic as one wishes. Living truthfully means that no matter how realistic or super-, un-, or sur-realistic the play is, we believe in the truth of it. Truth can be real or imagined, concrete or abstract. Truth is a much bigger concept than so-called reality. viewer. Since the image is a product of the angle of light refracting and reflecting from drops of water, as the viewer moves the rainbow moves accordingly and as we approach it, it recedes at the same rate. Yet, she did dance in the rainbow’s end. We must develop the ability to live the truth of the world of the play and of our characters. We must remove the wall of reason that reduces our work to “make-believe” or “pretend” even though the phenomenon-detecting machine of our brain knows that it is. When a child is at play, fully immersed in his imaginary world of dragons or cowboys or astronauts or dinosaurs, he, without work or study or training, is living in The Moment. This is why when his mother calls him in for dinner he doesn’t hear her. It’s not that he’s ignoring her or not “paying attention,” it’s because in The Moment, within that world, mothers and dinners don’t exist. Monks and yogis spend lifetimes developing the ability to exist within the Moment. Supposedly Bodhidharma cut off his own eyelids to find it (and from them, the first green tea plants sprouted – an image to entertain next time you’re enjoying a cup). But he had it easy: all he had to do while existing in The Moment was stare at a cave wall. We have to remember our lines, blocking and business; enunciate well; and pick up our cues. But in those blissful moments when we are in The Moment, Truth takes over and Art happens. We become Art, rather than artists trying to make art. Theatre, like most art, is telling the truth while lying. A painting may show us a landscape of trees and mountains, but it’s a lie, a counterfeit: it’s “really” just colored pigments on canvas. However, it contains the truth: it gives us the emotional and intellectual truth of the trees and mountains; it gives us the energy and soul of that moment of light and shadow, of rock and leaf, of ourselves. For art is ultimately a mirror. It shows us what we are stripped of our masks and egos. Art tells us the truth, but only if we are willing to allow it to. In theatre, we – actors and audience together – form an agreement: we decide to come together in a certain place, for a specified amount of time, and pretend to believe that which we know to be false in order to create/receive truth. We suspend our disbelief. The world of the play, its “atmosphere” as Michael Chekhov would say, is what we take to be true. If we say yes to the setting and relationships of the characters, and also to the “rules” of the play’s world – its physics and geography, its history and culture – we can then allow the imaginary circumstances to be true. There is an important distinction between “real” and “true.” You’re not “really” the Prince of Denmark, but you truly can be. To believe you “really” are is madness, to believe you “truly” are is genius. The actor must be able to maintain a sort of voluntary psychosis: to concurrently hold two opposing realities. He must be fully in The Moment: living truthfully, absolutely believing in the reality of the characters and situation. But at the same time, he must remain aware that he’s on a stage, in a theatre, doing a play. The Prince truly is desperate enough to consider suicide, but at the same time, he knows he better be in his light when he does it. Listening is not merely hearing. Hearing is what the ears do whether we want them to or not. But a vibration on our eardrum is utterly devoid of meaning without listening. Listening is a function of the intellect, the psyche, the soul. We listen with our entire being. Listening is reaching out with our will to connect with the Other, whether a fellow-actor or the world-at-large – it’s how we form the interrelationships that make life comprehensible, meaningful … bearable. By this definition, listening should be taken to refer to all of the senses available to us – a deaf person is as adept at this as anyone. Without this form of listening, there is no possibility of relationship. Actors must connect with each other as their characters for theatre to happen. An actor who merely waits for his turn to speak his line is not acting at all, he’s reciting – a trained parrot could fill the role just as well. Not only is listening what connects us to our world and each other, but listening, through this connection, is what keeps us in The Moment. 3. Art is a Process without End. There is never a moment in an artist’s life when she says, “I’ve learned my art.” Art is always and forever a process, a great “ING.” We are learnING, creatING, doING; not learned, created, done. With this in mind, we must always be seeking more. We should study those who have made the great discoveries of our art: Stanislavsky and Shakespeare, both Anton and Michael Chekov, Brecht, Grotowski, Arthur Miller, Uta Hagen, Sandford Meisner, Stella Adler, Anne Bogart, Tadashi Suzuki and all the others. Every script we encounter is also a vital teacher – every fellow-actor, director, designer, musician, scene painter and audience member. But more importantly, we must study ourselves. We must study Life. I believe the most important lesson on how to paint a tree is simply to learn how to look at a tree. To really see into it and discover it for what it is, not our preconceived notion of a symbol in our brain we label “tree.” The difference is immense. The same is true for theatre. We are seeking to “live truthfully,” and there is no better example of truth than life. Therefore, the major component of our study should be to develop an awareness and understanding of all the nuances, rhythms, music, colors, patterns and feelings of the world around us, of the people and places we encounter, of the moods and qualities of light, sound, texture, taste, smells and emotions that dance around, between and within us continually. We must become increasingly open and aware – hungry for experience. Everything, everyone and every moment is a teacher. All of us are students. The learning never ends. If we ever become convinced that we’ve learned what there is to know, we at the moment cease being artists. We join the ranks of the walking dead. 4. Theatre Can Change the World. If you ever doubt that theatre can change the world, remember the Nuremberg Rallies, but also remember ordinary German citizens taking sledgehammers to the Berlin Wall.